Theme: Knocking on an Open Door! 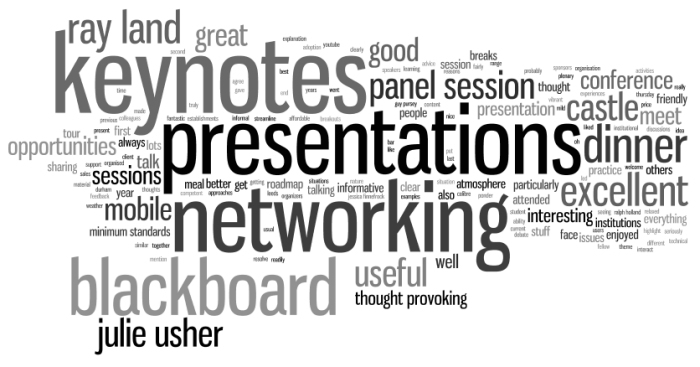 After considerable debate, the LTT were pleased to announce that the theme for the twelfth Durham Blackboard User’s Conference to be held on the 5th and 6th of January 2012 will explore openness. This is a hot topic in education and educational technology – think of open educational resources, open source software, open standards, open learning, open courseware, open access, open to all, open all hours*. What could, indeed should these terms mean to learners and teachers, the institutions and commercial interests that support, facilitate, measure, evaluate, archive, constrain or attempt to control these activities? This theme should resonate with anyone who has been within 100 miles of a Blackboard corporate presentation this year – “open standards”, “open database” and many other words implying a lack of closure now litter their slide decks. As a client you might want to put these claims to the test! We had 140 delegates from all over the UK attending from both Higher Education and Further Education sectors. Gráinne joined Beyond Distance as Director on 1st September, 2011. Prior to this, she was Chair of E-Learning at the Institute of Educational Technology, The Open University, since April 2006. Previously, Grainne was Professor of Educational Innovation in Post-Compulsory Education at the University of Southampton, and was Director of the Institute for Learning and Research Technology at the University of Bristol, a centre of excellence on the development and use of information and communication technology in education. Gráinne has research interests in the use, integration and evaluation of Information and Communication Technologies and e-learning and impact on organisational change. Gráinne has research, development and project management experience across the educational and technical domains; funding sources have included HEFCE, ESRC, EU and commercial sponsors. Very recent projects include the EU-funded projects OPAL, Design-Practice, and X-Delia, the JISC-funded learner experience project, the ESRC TLRP Technology-Enhanced Learning project, PI led by Eileen Scanlon and Mike Sharples, as well as an OU Learning Design Project. Past projects include the JISC LXP Learner Experience Proect, the HEFCE-funded E-Learning Research Centre, the JISC/NSF funded DialogPlus digital libraries project and the ESRC National Centre for Research Methods. Also see Gráinne’s website: http://e4innovation.com/ . Ray Land was recently appointed Professor of Higher Education at Durham University and Director of Durham’s Centre for Learning Teaching and Research in Higher Education. He previously held similar positions at the Universities of Strathclyde, Coventry and Edinburgh. He has been a higher education consultant for the OECD and the European Commission and is currently involved in two EC higher education projects. He has published widely in the field of educational research, including two co-edited books on learning technology – Education in Cyberspace (RoutledgeFalmer 2005) and Digital Difference: perspectives on online learning (Sense 2011)—and guest editing a double issue of E-learning. He has also produced several volumes on the theme of threshold concepts and troublesome knowledge, including the most recent Threshold Concepts and Transformational Learning (Sense 2010). We do not require anyone presenting at the Durham Blackboard Users’ Conference to submit their presentations, but are keen to see them shared if possible. This list has been culled from the #durbbu twitter stream and presentations emailed directly to members of the LTT. If you are a presenter and want a link to your materials added here, please get in touch.